Potential injuries & deaths of cetaceans are only reflected in military calculations by the number of animals that wash up on the beaches. Scientists speculate that dozens more simply die and sink to the bottom of the ocean never to be seen or counted in the death toll. 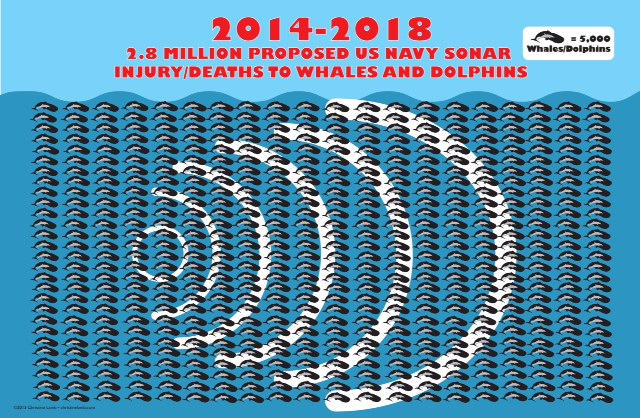 Current studies and scientific papers paid for by the US Military reflect more death and destruction to whales and dolphins then previously considered. The US Navy is choosing to ignore their own research and continue with their reckless behavior. ​Potential injuries & deaths of cetaceans are only reflected in military calculations by the number of animals that wash up on the beaches. Scientists speculate that dozens more simply die and sink to the bottom of the ocean never to be seen again or to be counted in the death toll. 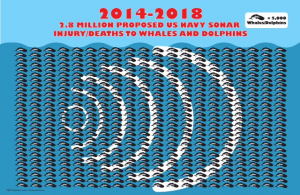 ​Current studies and scientific papers paid for by the US Military reflect more death and destruction to whales and dolphins then previously considered. The US Navy is choosing to ignore their own research and continue with their reckless behavior. Low-frequency active sonar signals destroy a whale, dolphin or other cetacean’s ability to navigate. Whales, Dolphins and other Cetaceans move using sound, vibration and instinct. Low -frequency active sonar signals destroy their innate ability to navigate, find food, call and locate their young, find other pod members and find a safe place to be. The U.S. Navy provides approximately 50% of the funds for marine mammal research worldwide. ​Primary papers are 2.3 times more likely to be cited in the reviews as concluding “no effect of noise” if the research was militarily-funded than if it was not. ​Thus, conflict of interest may have led to a misrepresentation of the effects of noise on marine mammals, and thus may misinform public policy decisions. Satellites: We now have satellite coverage of the entire world. Satellites can pinpoint a person’s door knob in a remote location. 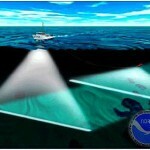 They can be used to survey vast areas of the worlds oceans for safety prior to the use of sonar. Drones: Drones can be deployed from ships to scan the oceans for signs of cetaceans, prior to emitting deadly sonar sounds. Other technologies that are not deadly to cetaceans have been worked with and funded in other times by the US Navy. We are calling on the Navy now to bring those technologies forward, without delay so more whales and dolphins don’t die. As in many instances, there are “moneyed” interests keeping us tied to old technologies (sonar technology is over 20 years old) when newer, harmless methods can accomplish the same ends. If pressure is applied to abandon the old, new technologies will emerge and we can relax knowing our ocean friends are being cared for in a humane and responsible way. The money being currently spent on an antiquated sonar program can be invested into new technologies, creating new jobs and supporting our now ailing economy. Sound penetrates an animal’s body when immersed in water. In air, 99.97% of the acoustic energy is reflected from a body. In water, however, there is no reflection or reduction of energy because the body is mostly water. This effect, which can and does cause tissue rupture and hemorrhaging in marine mammals and also in humans if they happen to be in the water. Another critical factor that has not been considered in any of the reporting is that excessive sound may rupture the membranes in algae destroying that plant life. Since 70-90 % of the oxygen on the planet comes from the ocean, this could have significant and long term effects on the oxygen levels of the earth playing a crucial part in the overall health of humans and our planet. Some nature scientists speculate that all animals have an innate ability to sense a impending natural disaster such as an underwater volcano, days or hours before an explosion and move to a safe area. The 2004 tsunami resulted in thousands of human deaths but very few animals dying. There were many reports of domesticated animals that had “broken loose” and escaped inland away from the waters several days before the tsunami. Whales and dolphins are said to have those same abilities in their natural ocean environment. However, any marine mammal unexpectedly near a ship emitting sonar would likely suffer a painful injury or death since their “innate intelligence” would not warn them of impending harm.